2. The entire process is completed without surgery or anesthesia. 3. Selectively target fat tissue to avoid heating other fats to achieve the fastest therapeutic effect. 4. Equipped with the most practical 40Khz ultrasonic cavitation system. 5. There are no side effects and the risk of gaining weight, and the results are quite obvious. Does not affect normal work and life. Unoisetion's powerful sound wave is 40000HZ. By using Ultrasonic Cavitation 2.0 technology, it can destroy these fat cells and eliminate the body's direct ability to store fat while improving the body's fat cells and metabolism, ultrasound cellulite treatment . 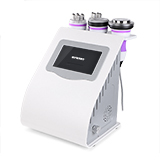 RF radio frequency can promote tissue metabolism, dissolve fat, lymphatic drainage, tighten skin, enhance skin elasticity, and finally achieve the effect of dissolving fat. The overall effect tightens the outer layer of the skin, reducing wrinkles. For body and face re-shaping.